Now for another fine Carpena sheet. This particular one covers aircraft operating in Vietnam from 1963-1975. The instruction sheet is in both English and French wit unit and color information given (in FS 595a references where applicable). 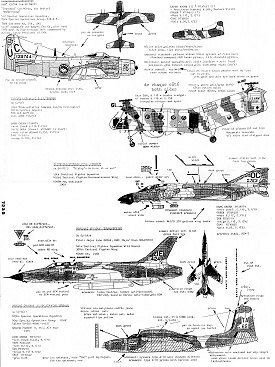 No specific kits are recommended and when this sheet came out, some did not exist (like the A-26K that is now out by Italeri). A listing of references is provided at the end of the sheet. Most US planes are in South East Asia (SEA) camouflage of FS 34102/34079/30219 over 36622. First up is a Vietnamese AF A-1H Skyraider from the 522 SOS. It is in 30117 Brown/34102 Green over 36622 Light Grey. The upper colors are approximations. No national insignia are carried on this aircraft assigned to Nguyen Cao Ky, the President of S. Vietnam in 1963. Next, from the 93rd Transportation company is this H-21 in a banded scheme of 34079, 34087, and 30219. The EF-105F is from the 44th TFS. 'Crown 7' was one of the earliest F-105 Wild Weasels without the large antennas one normally sees on the fuselage of the F-105G. Green tail tip and standard SEA camouflage. 'Mighty Mouse' is an A-26K from the 609 SOS, flying interdiction on the HoChiMinh trail. Standard SEA Camo. Not shown is an A-1H, 'The Proud American' of the 56th SOS (TS tail code). Again, standard SEA camo. 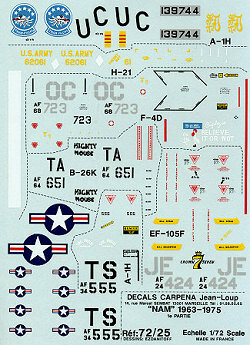 Decals are fairly well printed and offer insignia to do two of the options. Actually, you can do them all as I notice that most options don't have insignia on them. Review copy courtesy of your editor and his collection.